The EBubble extension provides an alternative to custom info windows. You can use EBubbles in a similar manner to info windows, but the technology is completely different, and causes significant differences in the behaviour. The background of an EBubble is fixed-size image file. That allows you to make the graphic as fancy as you like, but it's obviously only suitable in situations where your contents conform to a standard size. The EBubble is not attached to the map, it's attached directly to the <body>. This has the advantage that the EBubble can lie partly outside the map, but has the disadvantage that it doesn't move when the map moves. In order not to look silly when the map moved from under it, the EBubble closes when the map moves. In order to minimise strange click-through behaviour, by default the EBubble closes when clicked. 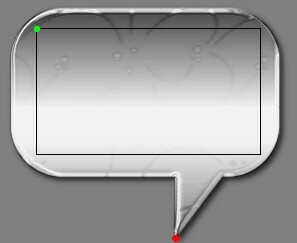 The background image for that EBubble was created in PaintShopPro using a simple speech bubble object. I applied the Inner Bevel effect to make it look a little 3D, added a central drop shadow, and gave the whole image partial transparency. Download ebubble.js and place it on your web site. Create one or more EBubble instances. map The map on which the EBubble is to appear. contentSize GSize() specifying the size of the inner area when the contents can be written. The content is not actually constrained by the contentSize parameter. If you put more content into it, then the contens will overflow. Specifying noCloseOnClick may sometimes cause strange click-through behaviour, but it might improve things if you're experiencing problems with clickable elements inside your EBubble contents. This opens the EBubble on the map that you specified in the EBubble constructor. html A string containing the HTML to be displayed. This opens the EBubble on the map that you specified in the EBubble constructor, with a location derived from the specified marker. marker The marker on which the EBubble is to be opened. You can have as many EBubbles as you like on the same map. You can use different background images for different EBubbles. The EBubble wil also close automatically if the map moves or if the user clicks on the EBubble. I provide a bubble.show() method, but I don't recommend using it, because it doesn't track map movements. If you want to re-open the bubble, use .openOnMap() or .openOnMarker() again. When an EBubble is clicked, it throws a "click" event. 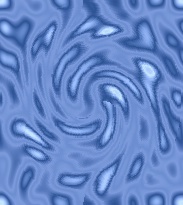 Here's an example which uses that image. Inspired by the Radio Shack Store Locator: www.radioshack.com/storeLocator3 (but not using any of their code) (I couldn't understand it).